In our long look at iPhoto, we’ve covered the interface basics, along with importing and viewing images. During those two lessons I took pains to do little more than mention Photo Stream as an option for viewing images. I avoided getting into the details, but now it’s time to dive in. Photo Stream is a component of Apple’s iCloud service. We can safely classify it as part of iCloud’s syncing services. The general idea is pretty simple. Once you’ve signed up for an iCloud account and configured it properly, you can sync any images on a device associated with your Apple ID with other devices that use that same ID. So, for example, if you’ve taken a picture with your iPhone, that picture can also appear on your iPad, your Apple TV, and (within iPhoto) your Mac. And it will do so without your having to select the image, tap a Share button, and choose to share it. It just happens in the background. This sounds simple enough. The potentially confusing part involves configuring it properly. Let’s see how to do that on all your devices. You begin by launching System Preferences (under the Apple menu) and selecting the iCloud preference. If you haven’t signed in to your iCloud account, do so now. (If you haven’t obtained an Apple ID, what are you waiting for? Click the link to do that.) In this window, enable the Photo Stream option. Then click the Options button that appears to its right, enable My Photo Stream and Shared Photo Streams, and click OK. Step one: Enable 'Photo Stream' in iCloud's preferences. The first option tells your Mac to automatically download new photos that are shared via iCloud and to upload to your other devices any images that you add to Photo Stream on your Mac. The second option allows you to share streams with other people, as well as subscribe to someone else’s stream. I’ll show you how each of these options works a bit later in the lesson. Now launch iPhoto and select the Photo Stream entry in iPhoto’s Library pane. In iPhoto’s main window, click Turn On Photo Stream. If you’re already sharing Photo Stream albums from another device (or from someone else’s shared Photo Stream album),those images will appear in the main window. To confirm that Photo Stream is configured correctly on your Mac, choose iPhoto > Preferences and click the Photo Stream entry in the resulting window. You’ll see four checked options: My Photo Stream, Automatic Import, Automatic Upload, and Shared Photo Streams. I’ve explained the first and last options. Let me continue with the second and third. When you turn on Photo Stream in iPhoto, four options are enabled. Automatic Import means that images that appear in your My Photo Stream album will be downloaded to and included in the Events, Photos, Faces, and Places albums. (On an iOS device, images are permanently downloaded to the device only when you add them to another album.) Because you've enabled the Automatic Upload option, any new photos that you add to iPhoto (up to the latest 1000 images) will be shared via your stream. These photos will remain in your Photos Stream for 30 days, after which they'll disappear (though they won't be deleted from their original source). So now what happens? With these options activated, your iPhoto images will be shared over Photo Stream to any devices that use your Apple ID and have their Photo Stream options configured correctly. And how do you accomplish that? Follow along. Macs, iOS devices, Apple TVs, and Windows PCs support Photo Stream. We've already seen how to set up your Mac to use Photo Stream; here’s how to configure the other three. iOS devices: On your iPhone, iPod touch, or iPad, tap Settings and then tap iCloud. In the iCloud screen, tap Photo Stream. 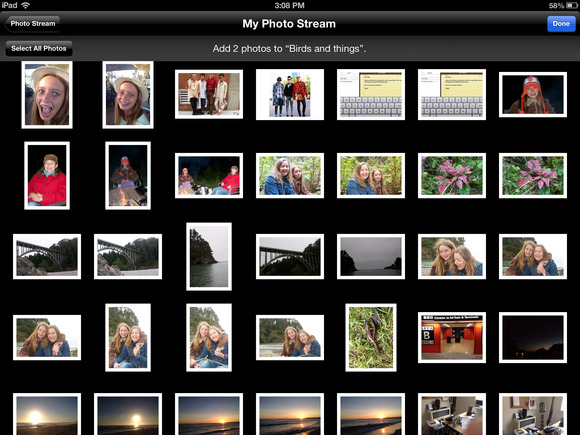 In the resulting Photo Stream screen, enable the My Photo Stream and Shared Photo Streams switches. Your device will now share the photos its takes and let you see photos added to your Photo Stream or added to any shared streams you subscribe to. I’ll discuss sharing and joining shared Photo Streams shortly. Apple TV: You’ll find Photo Stream on the Apple TV’s Home screen, about halfway down the screen on the left. Select Photo Stream and you’ll see any albums in your Photo Stream as well as those you’ve subscribed to. Choose an album and press the remote’s Select button, and you can view the images as you would any other picture on the Apple TV. To delete an image from a Photo Stream album of your own, just press and hold the remote's Select button until a window with a Delete Photo button appears. Press the remote's Select button again to delete the image from the Photo Stream album. To turn off your photos streams, scroll to the bottom of the Photo Stream window and click Settings. The next screen offers three options: 'Turn Off My Photo Stream', 'Turn Off Shared Photo Streams', and 'Sign Out'. Each option does exactly what it says. Windows: Yes, Windows users can take advantage of some iCloud features, too, which makes sense given that iOS devices work with Windows computers as well as with Macs. To use iCloud, Windows users must have a copy of Apple’s iCloud Control Panel for Windows. After installing it, log in with your Apple ID, enable the Photo Stream option in the control panel, and click the Options button. You’ll be presented with a window that asks you to choose a folder where Photo Stream images will be downloaded and another folder where you’ll add images to be uploaded to Photo Stream. These preliminaries are necessary because Apple doesn’t make a version of iPhoto for Windows. So drag and drop, and you're Photo Streaming.